Peng Chang Keui, the chef who concocted the recipe for the iconic Chinese culinary staple General Tso’s Chicken, died on November 30 from pneumonia, according to The Taiwan News. He was 98. If you need to eat your feelings, we know just the dish. For those who’ve never been to a Chinese restaurant in the U.S., General Tso’s consists of deep-fried nuggets of chicken sauced with a viscous sweet and savory sauce. And thanks to the enlightening 2014 documentary, The Search for General Tso, modern audiences are perhaps just as enlightened to the dish’s cultural impact as its ability to cure a wicked hangover. General Tso’s chicken is the most famous dish to come from Hunan, the Chinese province known for the unabashed heat in its cooking. But you won’t likely find a restaurant in capital city Changsha that serves the dish, at least not the way Americans are familiar with it. Due to the restrictions of the Chinese Exclusion Act, Chinese immigrants in the U.S. found food service to be one of their only viable career paths. To appeal to American palates, these cooks had to modify many of the dishes of their homeland—generally by making it sweeter. Peng said the earliest versions of General Tso’s chicken tasted typically Hunanese—“heavy, sour, hot, and salty,” as he told food writer Fuchsia Dunlop. Peng moved to New York in 1973 and opened his own restaurant in Manhattan. There, he altered the recipe for General Tso’s by making it much sweeter. It became a hit, a dish that would go on to be copied by almost every Chinese restaurant in America. 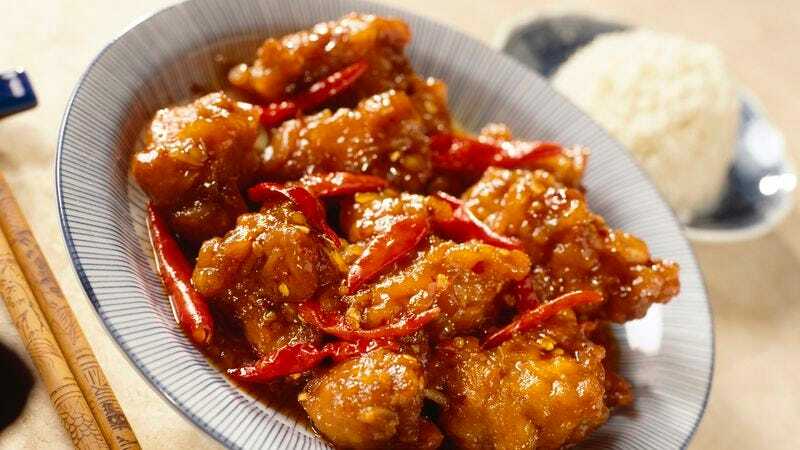 Ironically, when Peng returned to Hunan to open a restaurant, the Americanized version of General Tso’s chicken was received poorly by customers. In this regard, General Tso’s chicken remains the dish that truly signifies the West’s adoption of Chinese food. It is a dish that’s Chinese in origin, by way of Taiwan, but what’s become of it—the version you find at your neighborhood takeout—is wholly American.